St. Aidan's Adventure Treasury Book Launch — St Aidan's C.S. On the 22nd of April two of our 2nd year classes, St.Adas and St.Lauras, launched a children’s book that they had written, illustrated and published themselves. 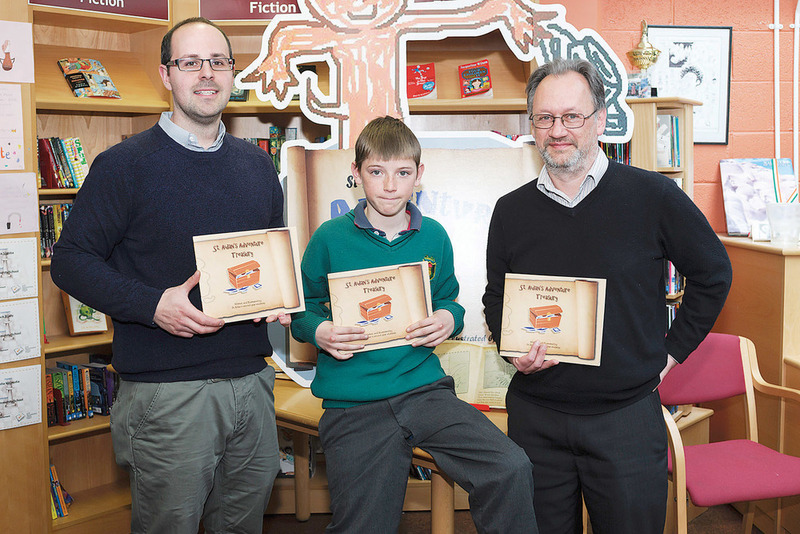 They gave a presentation and had a display for the book called ‘St.Aidan’s Adventure Treasury’. It was clear to see all the hard work the students had put into their creative and well-written book. Parents, Sr.Ann and many other close friends of the school attended this very thrilling event for our 2nd years. It’s a great thing to be able to say that you’ve written a book at such a young age. It’s the first time something like this has been done in the school and it’s an insight to some of the many talents that reside here is St.Aidan’s. The story’s showcase some of out talented writers and the handdrawn and computer drawn illustrations are amazing! After the presentations I had time to meet up with some of the students and get their opinion on the experience and the challenges they faced while writing a book. Was it as hard as you thought it would be to write a story/book? No not really, I really enjoyed doing it. What story did you write? Alfie the alligator, the two swans and Scrungy the rat. What story did you write? Friends. It’s about two girls, ones a marker and ones a pencil. They live in a school and no one uses them. They try to escape the school together. They get scared of the dark but make friends and have adventures. Anything you’d like to add? It was fun going to the exhibition and a good experience. Special thanks are sent out to Carmel Kelly, Andrew Kington and Martina Flynn for their contribution and dedication to the book and without them this wouldn’t be possible. May 1, 2015 by Laura Sloyan.